Get the 2013 Ford Transit Custom! Great van lease deal the all new 2013 Ford Transit Custom, only £199 + VAT per month based on a payment profile of £1,500 as an initial payment and 23 monthly payments after that. Contract is based on 10,000 miles per year. However, this can be adjusted to suit your personal requirements. Looking for a short term car lease? We have a range of car lease deals on a variety of cars. Here are 3 from Ford. Get the Ford Focus 1.0 EcoBoost Zetec 5 Door with Bluetooth and Sat Nav for just £299 + VAT per month. Price based on 3 + 11 and a mileage of 1,000 miles every 28 days. We also have a car lease deal on the Ford Fiesta 1.0 EcoBoost5 Door Zetec which includes Bluetooth and air con for just £229 + VAT per month. Price based on 3 + 11 and a mileage of 1,000 miles every 28 days. It’s not just cars that we have offers on. We also supply vans. Limited supply on the new, award winning, Ford Fiesta 1.25 Zetec 82ps 5dr just £99.99 + VAT per month on contract hire. Call us now to get this great offer and one of the last vehicles available, 01903 538835. Price based on 6 + 47 and 5,000 miles a year, though this can be adjusted to suit personal requirements. 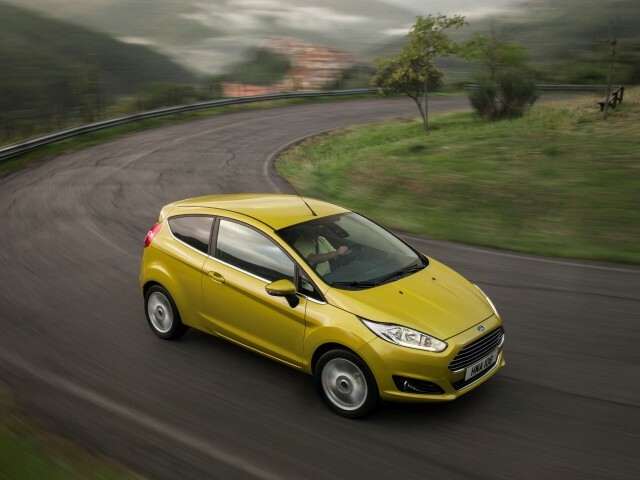 Click here to view official Ford Fiesta brochure. To learn more about leasing or buying a Ford, contract hire, vehicle finance or for more great deals and offers head to our website, e-mail us at sales@osv.ltd.uk or give us a call on 01903 538835. Ford-exclusive MyKey enables owners to programme a key – usually for younger drivers – that restricts the top speed of the Fiesta, reduces the maximum volume of audio system, and even disables the audio system altogether if driver and passengers are not using safety belts. It also can prevent the driver from deactivating safety technologies such as Electronic Stability Control and Active City Stop, which can help mitigate or prevent low-speed collisions. Selling Now: AstroTurfed Mitsubishi and Really Cheap Dacia. 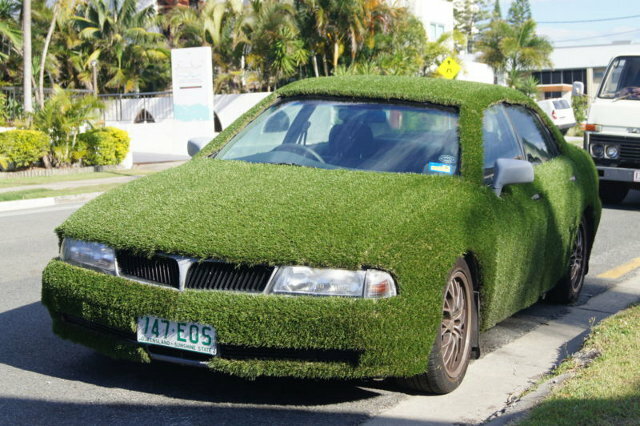 To help us through the mid week, I bring you the AstroTurf Mitsubishi of Queensland, Australia. Currently selling on auction for Au$510.00, this disaster of a car has received 36 bids in just under 4 days, with another 6 yet to go, I estimate it will sell for a couple of grand. To be honest, a large part of me applauds the extreme efforts people will go through to sell a car for more than it’s worth. This 1998 Mitsubishi Magna with 218,000 miles on the clock would have been lucky just to get a second glance, let alone $510.00 in just 4 days, you have to say, that sure is a creative way to spruce up a banger. No idea what the seller plans to do with the money he makes, but hopefully it’s buying a better car. With extremely positive reviews, the new Ford Focus has been named ‘Best Medium Car 2012’ and is expected to herald a new era of fuel efficient non-hybrid cars in the UK. To further cement its position as manufacturer of top-class vehicles, Ford’s Mondeo, S-MAX and Fiesta were all runners-up in other categories. The new Focus is a clear improvement on the previous model with its excellent engines, top build quality and funky interior which features centre console controls inspired by the button layout on a mobile phone. The car’s contemporary design and amazing refinements have phenomenally contributed to the huge sales witnessed with this model, both on lease and purchase terms, with figures hitting a high of 1,500,000 units, illustrating the degree of Ford’s dominance in its segment. Still wondering why you should choose Ford as your next vehicle to lease or purchase? 2011 marked one hundred years of Ford vehicles built in the UK with Ford remaining the leading manufacturer in terms of sales for over thirty years. With Ford commercial vehicles retaining the overall top position in the commercial vehicle category, it’s clear that Ford is still our number one choice when it comes to a vehicle lease or purchase. 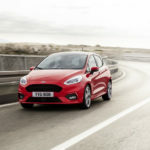 It is also evident that Ford is in pole position in terms of sales in the UK auto-market with records showing a total of 280,364 Ford units sold in 2010. 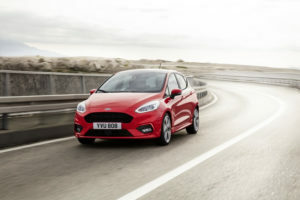 Ford Fiesta, the iconic small city car, takes first place as the best-selling model, with the Focus, one of the most technically advanced cars on the road, taking second place. Ford continues to go from strength to strength with the invention of such models as the Focus ST and the B-MAX. With many car manufacturers competing to produce and design car models that are less harmful to the environment, Ford Fiesta and Fiesta Van are no exception. The new technology witnessed in the Fiesta and Fiesta Van models has seen to it that the latest CO2 emissions fall to much lower levels. The ECOnetic Technology has resulted in significant improvements in both efficiency and general performance of the Fiesta and Fiesta Van. Technology comes with an upgraded 95PS 1.6TDCi engine, giving advancement in calibration and combustion optimization. Individuals who lease or purchase a Ford continue to be delighted in their chosen brand, as Ford continues to impress. Ford’s most recent ECOnetic model is doing extremely well in the market with its great performance and outstanding quality. With 87g CO2/km, this Ford Fiesta ECOnetic model is certainly right at the top of its tree when it comes to being economical. The low emission levels with this model translate to free road tax and no London Congestion Charge! In terms of fuel consumption, the car is superbly economical and conscious to the global economic crunch. The car has a negligible fuel sipping rate of 85.6mpg. The fast selling Ford Fiesta tops a car range that is popular for derogated CO2 emission levels seeing a remarkable drop to 134g/km from a staggering 154.5g/km.